Mathematical Studies is a course aiming to build confidence and encourage an appreciation of mathematics in students with varied backgrounds and abilities, who do not anticipate a need for mathematics in their future studies. The course focuses on real life applications of mathematics, using an inquiry-based approach, leading to the understanding of mathematical principles and their formulation into mathematical language. Students are given the opportunity to develop their logical and creative thinking skills, patience and persistence in problem solving. The course also aims to enable students to appreciate the elegance, power and usefulness of mathematics as well as its multicultural and historical perspectives. 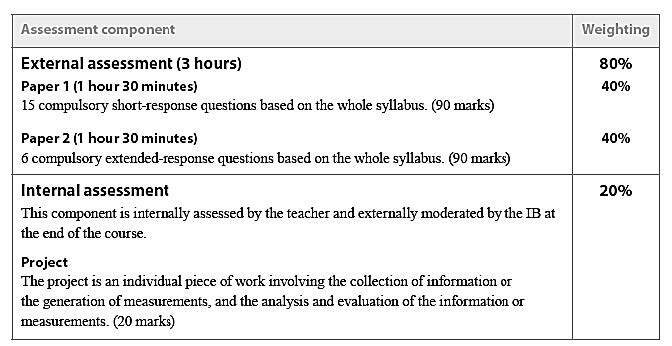 The assessment in Mathematical Studies aims to ensure that the students understand and use mathematical concepts and principles for problem solving, selecting appropriate strategies and techniques. The project (internal assessment) provides an opportunity for students to carry out a mathematical investigation in the context of other areas of interest, enabling them to see connections and applications of mathematics and acquire confidence in developing strategies for dealing with new situations and problems. The use of appropriate technological devices as mathematical tools is also an essential part of both learning and assessment processes. 10. Appreciate the contribution of mathematics to other disciplines, and as a particular “area of knowledge” in the TOK course. Throughout the DP mathematical Studies course, students are encouraged to develop their understanding of the methodology and practice of the discipline of mathematics. The processes of mathematical inquiry, mathematical modelling and applications and the use of technology are introduced appropriately. These processes are used throughout the course, and not treated in isolation.